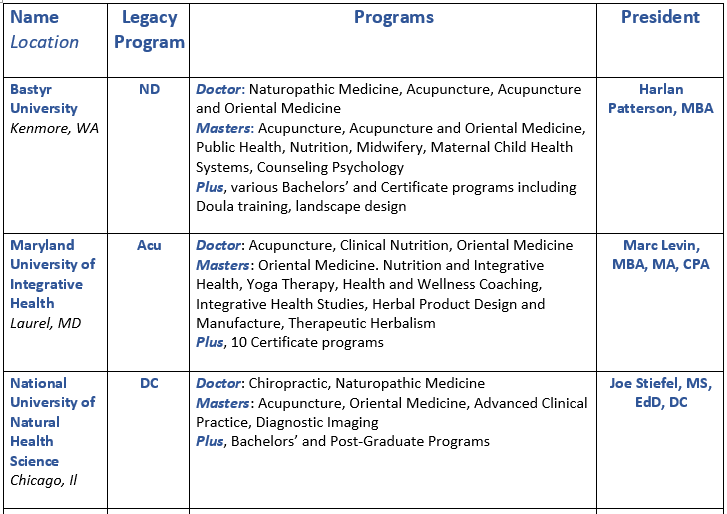 The past 20 years witnessed the expansion of a new type of institution in academic health care – and specifically in integrative health and medicine: multidisciplinary universities with professional degrees in multiple natural health fields. 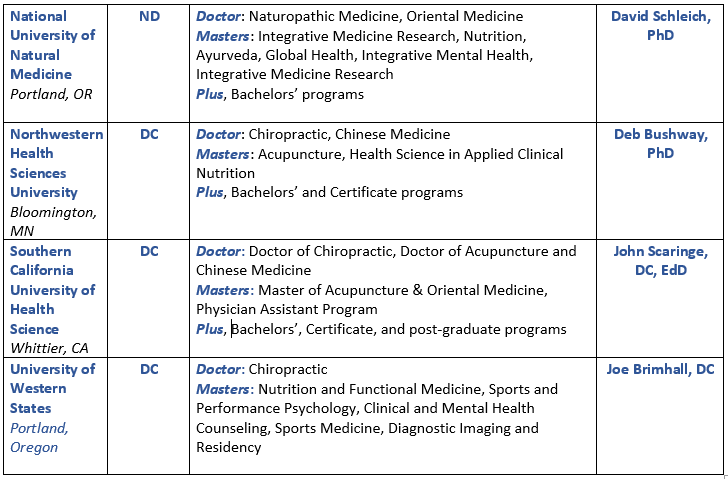 Variously denominated as universities of “natural health sciences” or “health sciences” or “integrative health” or merely as “university,” these 7 institutions were each founded as single purpose colleges to educate chiropractors, naturopathic doctors or acupuncturists. They expanded to include other disciplines, degrees and certifications. Many have played important roles in the integrative health movement. All sit at the intersection of two fields in turmoil: health care and higher education. I interviewed the presidents of each to access their vantage points. This overview is a first in a two-part series. The impulse to interview originated with two question. Were the present signs of uptake of integrative practices and practitioners in the Veteran’s Administration and elsewhere influencing their projections, plans and enrollments? And how were they were responding, relative to investment in research and policy, to influence the arc of uptake? Their involvement with multiple professions suggested a broader strategic perch from which each would respond. The first lesson was that for most, these concerns were, effectively, zephyrs in a larger storm. “It’s an interesting time in health sciences education,” reflected Joe Brimhall, DC, president of Portland, Oregon-based University of Western States: “We’re at the intersection of two industries in significant disruption.” Education and health care. In fact, the pervading spirit among the presidents of these universities – 4 founded to educate chiropractors, 2 for naturopathic doctors and 1 for acupuncturists – is entrepreneurial. Each university has initiated multiple new academic offerings, and is considering others. Educated as a psychologist, Deborah Bushway, PhD is the new president at Bloomington, Minnesota-based Northwestern Health Sciences University (Northwestern). Bushway formerly worked at the US Department of Education. She echoes Brimhall, with a dark twist: “I am increasingly aware that we are in the cross hairs of two industries.” Her work at the department included going to the nation’s capitol to promote a shift to a competencies-based outcomes agenda for education. Focusing on such outcomes (rather than, for instance, total number of patients adjusted by a student) parallels the value-based medicine shift to Triple Aim outcomes like patient experience and cost reduction (rather than the mere production of revenue from chiropractic manipulations, to continue the example). These transformations of educational methods are the sublime amidst the utterly mundane to which Scaringe’s data alluded. Expansion is seen as survival. Brimhall spoke for many: “We went from single purpose to university, partly to protect the university – and we did so by bring together some fields that have the same principles.” More programs can support faculty salaries and also the escalating administrative costs associated with regulation and accreditation. Five of the institutions have added nutrition masters programs. The growth and considerable success of the additions is linked to embracing one of the most disruptive forces in higher education: online learning. All of these academic programs are either hybrid or fully online. Each institution has focused this somewhat differently. Maryland University of Integrative Health (MUIH) offers a Doctor of Clinical Nutrition and a Masters in Nutrition and Integrative Health. UWS partnered with the Institute for Functional Medicine to develop their Masters in Nutrition and Functional Medicine. National University of Natural Medicine (NUNM) in Portland, Oregon has a Masters in Nutrition. Bastyr has a Masters in Nutrition that is, for those interested, also linked to a dietetics internship that can lead to an RDH. Northwestern offers a Masters in Health Science in Applied Clinical Nutrition. The perceived alignment of integrative values with public health is stimulating interest of multiple institutions in creating a Masters of Public Health (MPH) program. Presently, Bastyr is the only one to offer the degree. Bastyr’s new president Harlan Patterson, MBA, spoke to one value of a dual degree: “It’s a good way to get NDs into policy.” Notably, NUNM, the other of the 7 that began as a single purpose naturopathic college, presently offers a not dissimilarly missioned Masters in Global Health and is among those with an eye on an a future MPH, according David Schleich, PhD, NUNM’s long-time president. Masters in Yoga Therapy, at MUIH, developed in consultation with the International Association of Yoga Therapists. Integrative Physicians Assistant program at SCU. Masters in Midwifery and Masters in Maternal Child Health Systems at Bastyr, into which Seattle Midwifery School – a guiding beacon for the Certified Professional Midwives – was merged. A non-degree doula training is also offered. Masters in Ayurvedic Medicine at MUIH. Also at MUIH, Masters in Therapeutic Herbalism and another in Herbal Product Design and Manufacture. As with all entrepreneurial activity, crap-shooting is involved. Some programs are doing better than others. A website notice at one institution announced that its Board has chosen to terminate a program. After substantial investment, MUIH recently dropped plans to add a naturopathic program. Other programs are slow starters, and may face chopping blocks. How does one gauge the likely success of a first-time program amidst the wildness of change converging on these universities from both the industries in whose cross hairs they are operating? 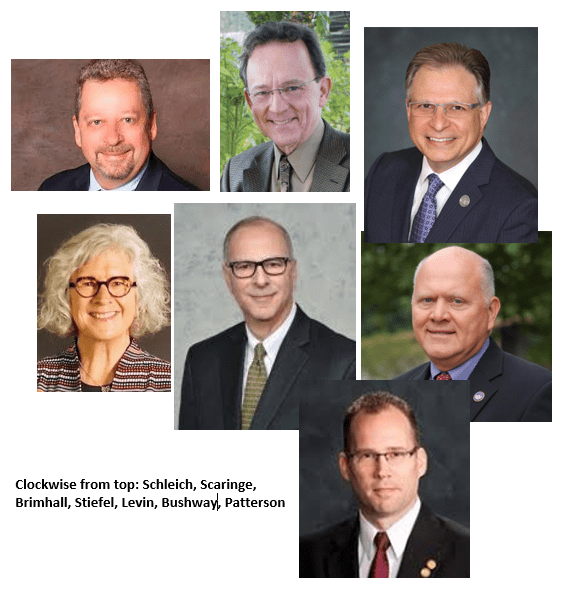 Note: Part 2 will follow up with more commentary from the presidents on the changing landscape for the professions, their investments in research and policy, the broader trends, and their responses. Disclosure: While I have had multiple relationships with these institutions over the years, including in my term as executive director of the Academic Collaborative for Integrative Health when I had the pleasure in 2011 of convening a meeting of then five multidisciplinary institution presidents, a notable present disclosure is that SCU is a sponsor of the Integrator.